Finally it’s here today! My pictures published. It is a great birthday present for me 🙂 Last year I mentioned in my post People of the Middle East: Egypt that Dr. Donna L. Bowen, one of my former professors at BYU, asked me if I had some pictures of people from the Middle East to include in the new edition of one her books. I sent her a few and then she chose some. It is rewarding to see some of my work published in a book that it is also required in certain classes of some universities in the United States. The book is called Everyday Life in the Muslim Middle East . I just got a copy of the book the cover is shown below. I should mention that not all pictures in the book are mine. What is Everyday Life in the Muslim Middle East book about? 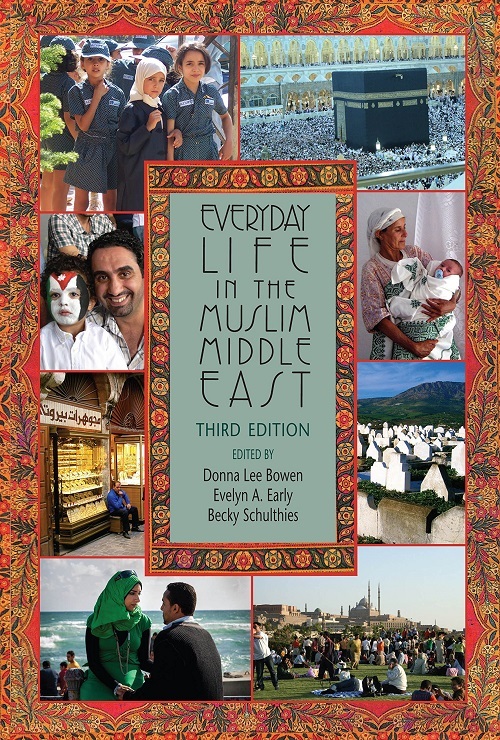 The substantially revised and updated third edition of Everyday Life in the Muslim Middle East focuses on the experiences of ordinary men, women, and children from the region. Readers will gain a grassroots appreciation of Middle East life, culture, and society that recognizes the impact of wars and uprisings as well as changes to Islamic practice due to advances in technology. The book also explores the influence of social media on politics and labor relations and the changing status of women, family values, marriage, childrearing, gender, and gay rights. This dynamic and imaginative volume continues to provide a rich resource for understanding contemporary Muslim culture in the Middle East. I used this book in one of my classes when I was at BYU. The book is organized in small essays that address different topics in the life of people in the Middle East. The book should not be seen as a comprehensive anthropological material, but as an introduction to the way Muslim society in the Middle East unfolds. We must keep in mind that it is hard to really cover in great detail all groups of people in the Middle East. First, Islam itself is not so uniform as some Westerners may think. Some Muslim groups interpret Islam based on their own narratives that can be secular or liberal, moderate, conservative, radical, and extremist. Depending on such views, this says much of how life is going to be for someone there. But besides Islam, we must consider economic and social classes, education, human and physical geography, country laws and government among others. All these factors shape the life and culture in any society. However, Everyday Life in the Muslim Middle East will give you a great glimpse of how life evolves in the region and how it is being affected by the new developments in the world. If you are planning a trip to the Middle East, yes, check out the tourist guides and travel recommendations, but if you want to really understand what you will see there, take a moment to read this book so you can get the most out of your trip to the Middle East. Regarding my pictures, some of them from my post People of the Middle East: Egypt were included in the book. Although all pictures were in black and white, there is at least one on the cover that is in full color. If you want to see the original picture here it is below. A couple immersed in each other’s gaze. Alexandria. Egypt. 2009. If you are interested in purchasing this book, you can get it in Amazon.com. Click on the image below to see price and shipping options. If you own this book, or if you have seen the pictures in it, I would love to hear what you think about the book and/or the pictures. It would be great to hear some comments.